As a manufacturer of cleaning products for both retail and I&I markets since 1991, Clean Control Corporation has made an effort to produce effective products using the safest chemicals possible that comply with environmental safety and health regulations. As a small family-owned business, we recognized the value of working closely with our partners, providing assistance with numerous regulatory issues, including support of continuous improvement ideals associated with green cleaning initiatives. Since incorporation in 1991, Clean Control Corporation has made an effort to produce effective products using the safest chemicals possible. Environmental preferability has been a cornerstone from the foundation of Clean Control Corporation. One aspect of Clean Control Corporations efforts in the area of sustainability has been our work with third party certifiers. While “green” branding or “eco” labeling is an important aspect of our marketing efforts, it is only one aspect of our work with the DfE Program third party certification programs. This sustainability process involves a combination of many complex problems including the availability of safer chemicals, understanding of what constitutes a safer chemical, the costs of changing formulations, and uncertainties in the marketplace. Many States include Green Seal and the U.S. EPA Safer Choice Label (formally the Design for the Environment) as approved ecolabellers for meeting the requirements of Green Cleaning in Schools legislation. Use of approved third party certification programs makes it easier, faster and more cost effective to determine if the products have safer human and environmental toxicological profiles. CSPA is the premier association representing the household and institutional products industry, providing exceptional member value by engaging the membership in fostering best practices through Product Care to maximize the safety and sustainability of our members’ products and services. The Product Care Steward program is a voluntary program developed by CSPA assist in applying the Product Care principles to stewardship activities. For more information see http://www.productcare.com/stewardship/. The Sustainability Consortium® (TSC®) is a global organization dedicated to improving the sustainability of consumer products. TSC convenes these diverse stakeholders to work collaboratively to build science-based decision tools that address sustainability issues that are materially important throughout a product’s supply chain and lifecycle. For more information see: http://www.sustainabilityconsortium.org/. June 2004 We began our association with the Design for the Environment (DfE) Program in an effort to obtain the most up-to-date information on components used in our cleaning formulations. August 2005 We formalized our commitment to the DfE Program by signing a Memorandum of Understanding (MOU). These formulations include bathroom cleaners, glass and surface cleaners, degreasers and carpet cleaners. August 2006 DfE initiated third-party review of new product submissions. June 2009 DfE issued Criteria for Safer Cleaning Products (CSCP) in the form of a standard. September 2012 DfE issued enhanced Standard for Safer Cleaning Products Revisions in green. December 2014 Clean Control Corporation completes Walmart, U.S. EPA, and CSPA ingredient disclosure initiative through public online disclosure. April 2015 Clean Control Corporation initiates participation in The Sustainability Consortium® for hard surface cleaners and non-aerosol air fresheners and submits results to major retailers for use in supplier sustainability evaluation. U.S. EPA’s Safer Choice Label helps consumers, businesses, and institutional buyers identify cleaning and other products that perform well and are safer for human health and the environment. This standard is for industrial and institutional general-purpose, restroom, glass, and carpet cleaners, defined as those cleaners intended for routine cleaning of offices, institutions, warehouses, and industrial facilities. 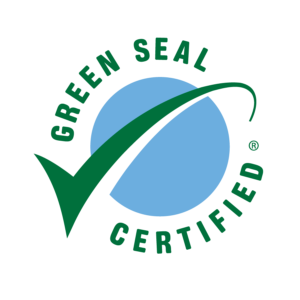 When you see the Green Seal logo on a product, what does it mean? When you see the Safer Choice Label on a product, what does it mean? When you see the Safer Choice Label on a product it means that the EPA scientific review team has screened each ingredient for potential human health and environmental effects and that-based on currently available information, EPA predictive models, and expert judgment-the product contains only those ingredients that pose the least concern among chemicals in their class. We at Clean Control Corporation applaud the efforts of our partners to protect children and employee health. We believe that third party certification programs for product formulations should be based the most credible scientific guidance available and under guidelines for procurement of environmentally sensitive cleaning & maintenance products.